In the United States, the term “Swiss cheese” is used generically for light yellow cheeses characterized by large holes and a salty, mildly nutty flavor. American Swiss cheeses are mass-produced imitations of the original Emmental and Gruyere varieties, very famous cheeses made in Switzerland. The large holes in Swiss cheese are called “eyes,” and any Swiss cheese without eyes is referred to as “blind.” The eyes are formed during the later stages of cheese production when the bacteria P. shermani absorbs lactic acid released by other bacteria and then gradually releases carbon dioxide. The carbon dioxide forms expanding bubbles that make up the eyes. Cheese has long been an important specialty of the Swiss. Switzerland’s oldest and most well-known cheese, Emmental, has been produced since 1293 in the Emmental Valley. American Swiss cheese is a manufactured quickly on a large scale so that it is widely available at a low price. Allowed to age for only four months, its flavor lacks the richness of genuine Swiss cheeses, but it nevertheless makes a tasty and popular sandwich addition. Emmental (Emmentaler, Emmenthaler) Swiss cheese is the most famous of Switzerland’s original cheeses. Its flavor is mild with fruity, nutty and buttery tones, and its eyes range from very small to olive-sized. Gruyere Swiss cheese is sweeter than Emmental because it is made with a fattier cow’s milk. Its holes generally shrink during its 10 to 12 month aging period, making them much smaller and more evenly-spaced than those of Emmental. Baby Swiss cheese is another cheese marketed in the U.S., which shows fewer eyes and offers a milder flavor than other Swiss cheeses. These unique characteristics result from the use of water rather than milk’s whey during production, which slows bacterial growth. The presence of larger eyes in a Swiss cheese is generally a reliable indicator of a more distinctive flavor. A longer aging period or warmer conditions cause the eyes to grow larger, and the enzymes and bacteria enrich the cheese’s flavor. Don’t purchase Swiss cheese that sports a gray rind; it most likely means that the cheese has aged too long or has not been packaged properly. When looking for a genuine, aged Gruyere cheese, make sure to check the label. There are many processed, imitation versions of Gruyere available commercially that don’t offer the same rich taste. Swiss cheese should be wrapped tightly in plastic wrap or foil. In blocks, it can remain refrigerated this way for up to two months, and when sliced it can last up to a month. Remember that the cheese will continue aging in the refrigerator, so its flavor will grow more and more intense. If you have very large blocks of Swiss cheese—no smaller than half a pound—they can be frozen for up to six months. To freeze a block of cheese, wrap it tightly in plastic or foil and then zip it inside a plastic storage bag, pressing out as much air as possible. Defrost cheese in the refrigerator and use it soon after defrosting. Defrosted cheese is best when cooked into dishes as it will likely become too crumbly for sandwiches or plain snacking. 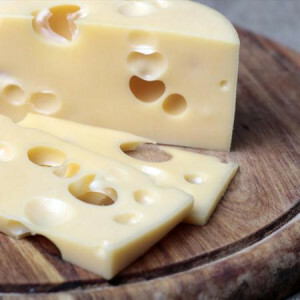 The large holes in Swiss cheese are called "eyes," and any Swiss cheese without eyes is referred to as "blind"